In the meantime, Kalinko had the idea of asking the inhabitants of the birdhouse to give him a hand. A couple of ibises were looking for insects. is hiding in the willow. I need an intelligent bird who can fly into the tree and use some initiative to steal his wand!" "I'll help you", Iris the ibis promised. "Can you slip out of sight if you have to? ", the king asked. "Oh, I'm so thin that when I want to be I'm invisible", replied Iris. "If I fold my wings in and stick my bill up in the air, I look just like a twig!" "How interesting, I thought only bitterns can do this", replied the king. 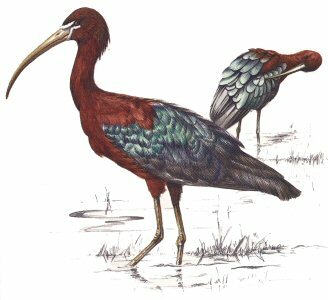 "I'm the only ibis who will do it, because Issie Bittern, showed me how." Now, we know that Zettelwitz wasn't sitting up in the tree any more. He'd been inching his way toward the birdhouse and listening in. "Very witty! Well, I can imagine a way to improve on your idiotic ideas! Iris, why don't you do an impression of an I instead?" "Yikes!" piped Iris and tried to fly away. Busy Lizzie, dizzy Izzy! Ibis must become an I! A TINKLING LIKE ICICLES! AN INSTANT FLASH! Iris Ibis stood stiff and still, changed into an I! "Eighteen letters in the bag now!" But Zettelwitz was just too sly. His index now includes an I.